An explanation of our approach which does not use technical language can be found on the “Understanding Your Symptoms” tab, which also has a page explaining the words which we use. There is substantial evidence that patients with medically unexplained symptoms (MUS) and functional somatic syndromes (FSS) suffer from the physiological effects of sustained psychosocial stress. Within the loss of homeostasis, hyper-arousal creates a widespread imbalance affecting limbic system self-regulation, the hypothalamo-pituitary-adrenal (HPA) axis (creating a sympathetic/parasympathetic imbalance), and immune competence. Breath regulation may also be disturbed, resulting in hyperventilation and subsequent respiratory alkalosis and reduction in transfer of oxygen to the brain and tissues. The patient will find it difficult to release their symptoms whilst there is a sustained focus of distress within a persistent state of fight, flight, freeze and fold response. However, explaining such symptoms to patients as simply due to “stress” has been shown to be an ineffective and unpopular intervention. A biomedical model of disease is also not helpful to the patient with functional symptoms. In the search for remediable pathology, clinicians over-investigate and in the process leave patients anxiously thinking that there is still a remediable cause for their symptoms that will be discovered by yet more biomedical testing. In both MUS and FSS the patient will often complain about one dominant and enduring symptom, together with many other distressing bodily symptoms. These patients often fall through a gap in healthcare provision because a dominant symptom, such as bowel disturbance in irritable bowel syndrome, may be perceived as the domain of a single speciality (in this case gastroenterology). They are then treated as if this is solely a biological disorder rather than one of dysregulation of many overlapping physiological disturbances. There is considerable overlap between the different functional somatic syndromes. For example, in patients with irritable bowel syndrome symptoms of nocturia, frequency and urgency of micturition, incomplete bladder emptying, back pain, an unpleasant taste in the mouth, a constant feeling of tiredness and dyspareunia were particularly prominent and highly significantly different from controls. Patients with functional chest pain also exhibit symptoms of other functional disorders including irritable bowel syndrome. We believe that the logical first step is to reduce the patients’ health anxiety by supplying an empowering and credible scientific explanation for the origin of their symptoms. Explanations citing disturbances of limbic system functioning have been shown to be acceptable to GP’s and psychiatrists, and to be effective in reducing MUS. 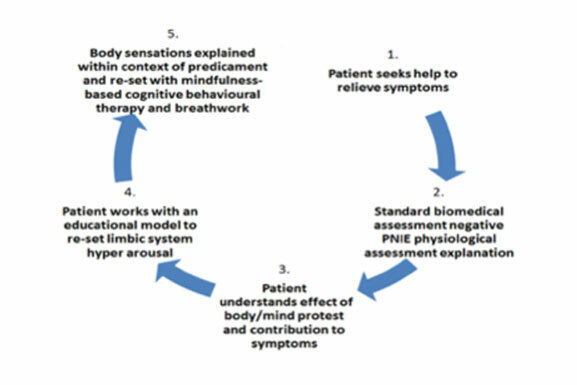 The existing evidence suggests that the most promising recovery model is one based on mindfulness-based cognitive behavioural therapy coupled with breath work. Expert ex-patients, who have themselves recovered by using these methods, are best placed to lead an educational intervention. Within this model, the aim is to teach approaches that enable a self-calming and quietening response that changes state by re-setting sustained stress responses. 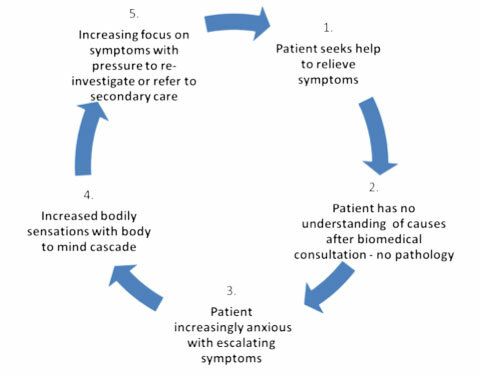 Then an enquiry by the patient, supported by the coach, identifies those factors that restore an energetic engagement with life and with it self-management and understanding of the sustained stress that created the symptoms. The patient may then regain a sense of self-empowerment which will enable them to develop a recovery strategy in which their emotional needs will be met.